February may be the month of love for people, but animals have their own cycles. The bison, elk and whitetail on the farm are only concerned about romance in the fall, when the animals have grown fat on the lush summer grasses. As the leaves turn colors these animals go into the “rut” which is when the males forego their normal routines of eating and sleeping and become amorous toward the females and aggressive to each other. Bison bulls can be very tender to the cows at this time. When a bull singles out a favorite, he stays with her, standing by her side, nuzzling her flank and giving the stink-eye to any other bull that comes near her. He doesn’t eat, drinks rarely and love alone sustains him through this time. This is when the bulls will fight in earnest, using knowledge gained from half-hearted summer tussles against each other. Dirt flies and the bulls bellow at each other, roaring like lions in the Serengeti. Luckily the rut doesn’t last very long and after a couple of weeks there is peace in the pasture again. Throughout the winter, the bison concentrate on eating and resting. The calves are growing inside their mothers, and the herd gathers close for warmth and waits for spring. It is a peaceful time for everyone on the farm. When the occasional snowstorm blows in, the well-insulated bison seemingly take no notice, as their heavy winter wool is so dense that the snow drifts on their backs rather than melting. As winter warms into spring and the grass begins to grow again, the cows, now heavy with calves, nibble hungrily on the new growth. 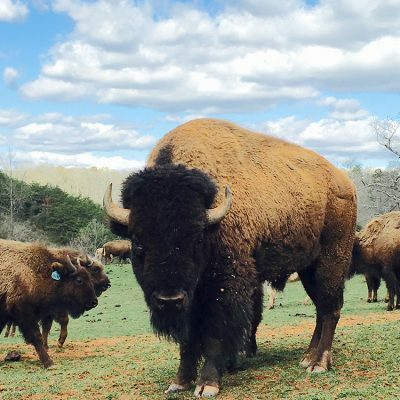 The growing grass, a nice change from the hay they have been eating all winter, will help those babies grow and provide the cows with the sustenance they need to produce the rich milk that bison calves thrive on. By the end of spring, when the nights are warmer and the grass is lush, the babies are born. Due to the concentrated timetable of the rut, most of the calves are born within a few weeks of each other. The green hills are dotted with little fuzzy red babies tottering along next to their great, shaggy brown mothers. The new calves are so small, only about 35 pounds when born, that compared to the cows they don’t even look like bison! In fact, a nickname for them is “red dog,” as they have no hump nor the characteristic bison shape or color. All legs and flicking tails, they follow their mothers over the green hills, tasting the grass and stretching out to relax in the warm sun. Summer rolls on peacefully and the calves grow quickly. They shed their fuzzy red coats and grow the dark and shaggy hides they will wear their whole lives. On a diet of rich milk and green grass, they will be almost half the size of their mothers by fall when the bulls start to bellow again. When the new calves come the following spring, last year’s young will be on their own and the cycle will continue, as it has for millennia.